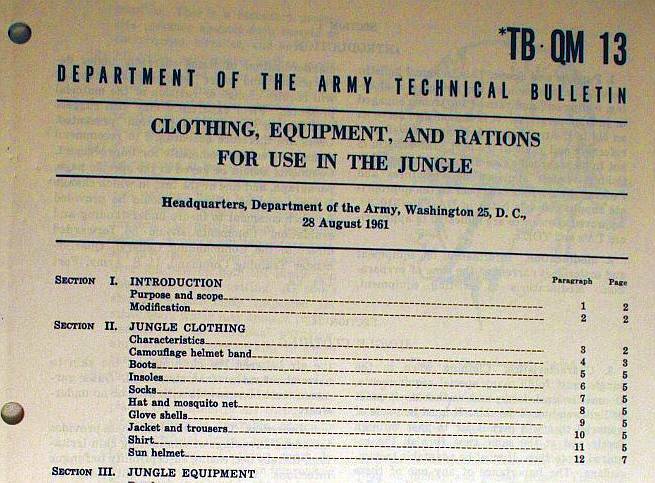 For example, the experimental jungle boots, manufactured in September 1942 by "Geo. Keith Co." featured brown leather lower and green canvas upper, lined with poplin fabric. 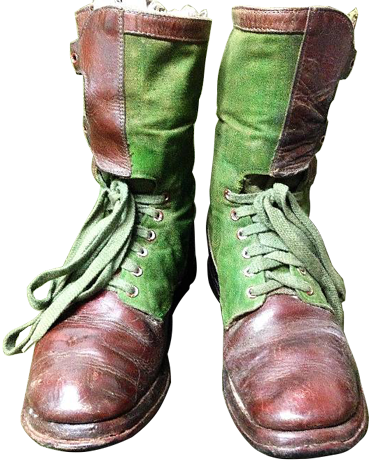 The unlined boot's tongue was also made of green canvas and impregnated with water and/or gas repellent. The peculiarity of these boots is 3-buckle closure for a 12,5 inches (31,75 cm) tall boot. "Goodrich"-made rubber out-soles and heels were stitched and glued, and the heels were square-shaped. Actually, the canvas and leather Tropical Combat Boots were developed in the year 1944 and put into manufacturing during the summer of the next year - too late for mass production, because the Second World war was over. 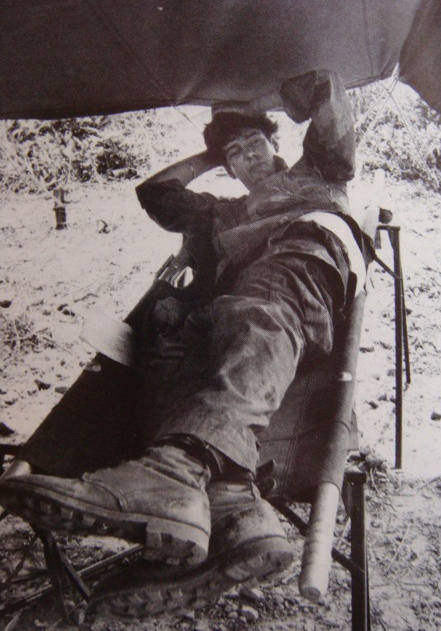 Though the production was canceled, these boots were issued at the early stage of the war in Vietnam, and continued to be issued until the year 1965, when new types of DMS jungle boots with Vibram-type out-soles came into service. 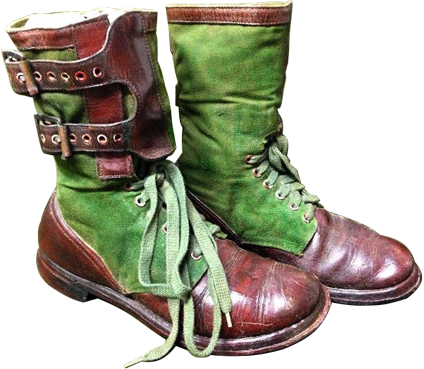 The brown leather and green canvas boots shown on the Picture 1 were made in June, 1950. 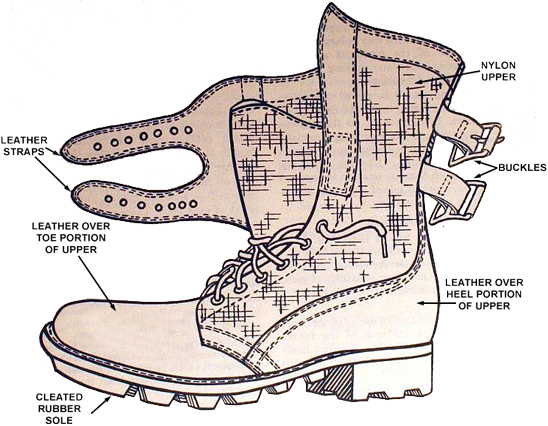 The two-buckle fasteners on the upper part of the boots were exactly "borrowed" from the two-buckle M-43 all-leather American WW II Combat boots (Picture 2). These double buckle "jungle" boots with brown leather and canvas panels for tropical climates are also referred to as "M-45 Tropical Combat Boots" or "Okinawa boots", because in the early years of Indochina conflict many American advisors were sent to Vietnam from U.S. military base in Okinawa, Japan. 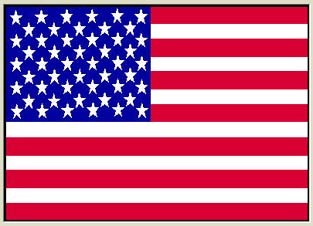 TB QM 13 (Department of the Army Technical Bulletin (Quartermaster Manual)) of 28 August 1961. The boot chart of the year 1951 specifies "Boot, Combat, Tropical" made of leather, nylon duck and rubber, weight per pair is 3,88 lbs (1,76 kg), which are to be worn with 1 pair of socks (wool, cushion sole) and 1 pair of ventilating insoles (total weight 0,29 lbs (132 g)). These "jungle" boots (quick-drying, permitting sweat evaporation and ventilation and providing good traction with surfaces) were designated for forests, jungles and grasslands under tropic and semi-tropic conditions. 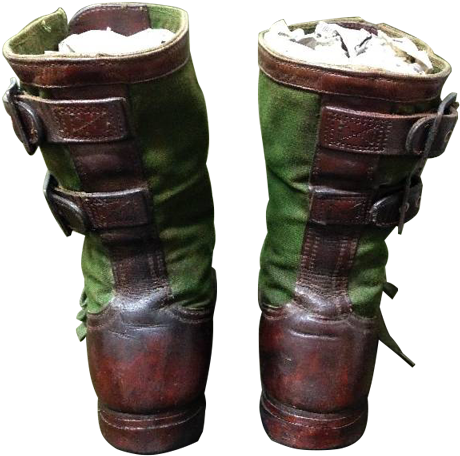 The leather parts of the boot's top were intended to provide robustness of construction and tight grip of the legs in boots. As the leather is more thick and rigid in comparison with soft and thin canvas, it provides better protection from insects, pebbles and other hard and sharp objects that could potentially injure the feet. The canvas panels are intended to provide better temperature and humidity regulation of the feet inside the boots, and to make the overall construction more lightweight and easy to dry.